Banana Cream Pie is easy to put together and tastes wonderful. 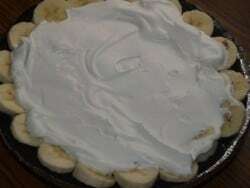 You can make a banana cream pie anytime with our recipe. We were asked to remove the name of the restaurant from this recipe, I guess we were too close on this one! Banana cream pie is a classic diner dessert that can easily be made at home. Mix in a 2 quart sauce pan sugar, cornstarch, salt, evaporated milk and whole milk. Cook over medium heat stirring constantly until mixture thickens and boils for 1 minute. Remove from heat slowly pour half of the hot mixture in to eggs and stir until that mixture is completely incorporated. Then pour the egg mixture in to the pot with the other half of pudding and continue to cook on medium heat until it reaches boiling stage again. Add cream cheese and mix thoroughly (use a hand mixer). It will dissolve the cream cheese better and make the pudding lighter and creamier. Remove from heat and add vanilla and butter, keep using the hand mixer until all is blended. Let pudding stand for 15 minutes but while still warm pour half of pudding in pie shell and layer with bananas then pour remainder of pudding on top. When pie is completely cooled top with fresh whipped cream and garnish with sliced almonds. Pour cream into a glass or metal bowl and beat until soft peaks form gradually add powder sugar until all has been blended and then add vanilla slowly until it has also been blended. Mixture should have stiff peaks. The whipped cream may be put into a pastry bag and used for that added effect. I just made this and I have a few things to say about it. This is a good pie and it is the kind of pie my grandmother would have made, totally a classic banana cream pie. As I made the custard, I added the vanilla. I tasted it and I wondered what it would be like if I added banana flavoring. I added about 1/2 teasoon of banana flavoring. In general, it was not a good idea. The banana flavoring seemed to throw it off balance and I had to add a few tablespoons of sugar to bring it back. So, if you want to try adding banana flavoring, only add a hint…and if you go to far a few spoon fulls of sugar might help. But don’t go to far on the sugar, this pie is not meant to be super sweet. Next, I used the smaller sized store bought graham pie crust. The graham part of the crust was fine, but next time I would use the larger size of store bought crust. 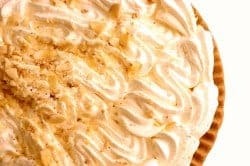 The banans and whiped cream make this pie and I added extra layers of bananas and a thick topping of whipped cream (I used cool whip to save time). Lastly, what I would say is that this is not a pie I would make for a pot luck. I would just make it to have at home. This pie is a bit messy to slice and pull out (especially if you cheat like me and add extra layers of bananas). If you want to do something with banans for a pot luck, a banana pudding you can spoon out is a better choice. Over all a good not too sweet pie to serve on a lazy Sunday afternoon. It is amazing how a tiny change in a recipe than through off other parts of it. I bet this would be good with a tiny bit of banana flavoring. I appreciate the changes you made the to the pie. This pie was to mimic Marie Callendars, and they did not add the extra layers of bananas, but I bet it would be very good lie that! This was delicious! The whole family loved it!